Helen Hall's husband just sent the news about Helen passing on 23th September 2006 at 10:45 pm after a short battle against lung cancer. She died in her sleep and had no pain. She was one of the few female acts on the Big D Jamboree in the 50's with Charline Arthur, Sunshine Ruby and, sometime, Wanda Jackson. Let me tell you the story of that lovely small five foot country girl who was my friend. 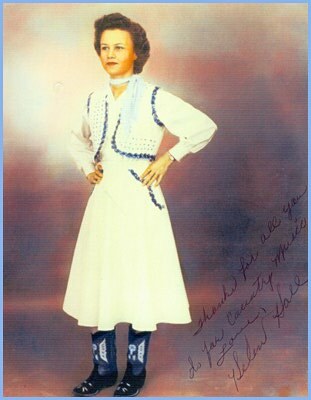 Helen, a Texas native gal, was really popular at the Big D Jamboree since her first show in October 1954. She shared the stage with Charline Arthur, Sonny James, Elvis Presley, Jimmy & Johnny to name a few of the big names of the times. She performed also as duet act with Doug Bragg who had later records on "Dixie" and "D" labels. A session at Jim Beck's studio in Dallas, in January 1955, lead to a single for "Coral" records coupling "Honky Tonk Husband" and "Wasted Life". Two others songs will stay in the vaults as "Coral" dropped her after a car wreck in April 1955. But, as soon as September 1955, she was back on stage and was on magazines as Country Song Roundup. In 1957, she recorded a demo of "Hello Baby" in Charline Arthur's home in Fort Worth. That great recording was issued on CD by Dragon Street Records few years ago. Later, Charline Arthur will record her own version of that song for "Coin" records. But, the most often hear version of the song is the one by Bob Luman issued on Rollin' Rock records in the mid 70's. But how many of us knew than "That's Allright", another great rockabilly song on that EP, is also a Helen's composition. The original title being "Have It Your Way Baby" many of us don't know about that connection. On all those demos recorded in 1957, Helen is backed by Charline Arthur on guitar and her husband Jack Arthur on bass. Helen was a prolific composer and she offered "Two of A Kind" to Johnny Horton. She sent him a quickly made demo of the song for a scheduled recording session. Unfortunately, the demos came late and The singing Fisherman never recorded the song. Tillman Franks, then in charge of The Louisiana Hayride Artists Bureau, offered Helen's to join the show. But, being mother, she was afraid to have to fly every Saturday from Fort Worth to Shreveport so she missed her luck. She stayed at The Big D Jamboree were she meet and liked the young Joe Poovey. At the start of the 70's, Helen worked with Willie Nelson and Kris Kristofferson and had a single on "D" record in 1972. In 1973, she recorded two sides in Nashville produced by Louie Innis. "Footprints" and "What Else Does She Do Like Me", two fine country songs, were issued on "Loco" records. Helen was featured on the excellent American magazine "Blue Suede News" in 2001 and had just received an offer from Hollywood for her song "Hello Baby" being used in a movie. She may have not many records out but her name will always be associated with the golden days of The Big D Jamboree. Helen, a cute little woman, had write to me the followings words: I am always happy to autograph pictures and records for fans. I am so fortunate to still be having fan mail after all these years". She used to have worldwide mail and still used original KRLD paper sheets to answer. May she rest in peace and sing in the upper choir with her friend Charline Arthur.